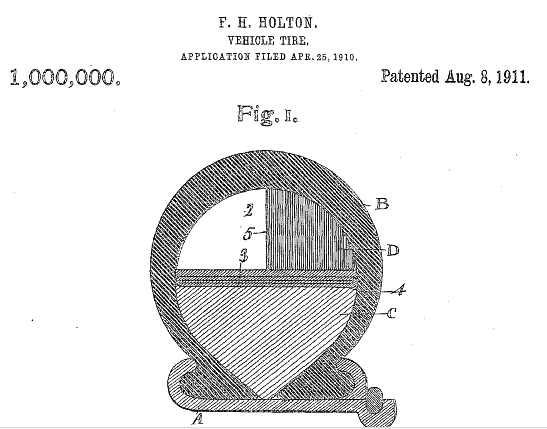 Although there over a million patents that relate to the term “Vehicle Tire”, The US patent assigned to Francis Holton on August 8th, 1911 holds a special place at the USPTO. It was the millionth patent issued by the office. It took the patent office 75 years to reach 1 million patents but after that the system was booming with intellectual property. It only took 24 years to get to patent 2 million which, ironically, was related to the safety and longevity of pneumatic tires. The trend continued its momentum to get to the over 8.5 million patents registered with the USPTO today. Taken from a USPTO press release back in 2009 when they celebrated their milestone of 7 million patents, a summary of each millennial milestone. August 8th, 1911 – “Vehicle Tire”, a tubeless tire. 24 years later, April 30th, 1935 – “Vehicle Wheel Construction”, the safety and longevity of pneumatic tires. 26 years later, September 21st, 1961 – “Automatic Reading System”, an automated system that translated letters, numbers and symbols to data processing code. 15 years later, March 19th, 1991 – “Ethanol production by Escherichia coli strains co-expressing Zymomonas PDC and ADH genes”, issued to the University of Florida for a process to produce fuel ethanol. 7 years later, February 14th, 2006 – “Polysaccharide fibers”, fibers that have “cotton-like” properties but can be produced as continuous filaments on a year-round basis. The fibers are useful in textile applications. Then finally 5 years later the USPTO hits the 8 million mark with a visual prosthesis apparatus patented by Second Sight Medical Products, Inc. If the USPTO is already at the 8.5 million mark, then it is possible we will see 9 million around 2015 and even hit 10 million before 2020. Looking beyond just these numbers we realize that there are vast amount of others patents being issued around the world. What this suggests is that the intellectual property process has its worth as ideas are protected around the world.